On the day of the National Holy Jordi, 23 April, the Plaça de Sant Jaume is a centre of the bustle, roses and books stands. The Palau de la Generalitat (Palace of the provincial government) which is only open on Sundays for the public, opens on this day. Otherwise, there is more to this place like the blue of the city police, the palace guard, instead of the red of the roses. In the week of the city festival "La Mercè" will find breathtaking spectacle, such as the fire run, the huge dragon and fire spouting drakes, or the Bal de Gegants. Huge figures in human form go to the square. Similarly there find competitions in building castles - the human towers. The Plaça Sant Jaume has always been in history. Even in the time of the Romans, it was an important place. Here, two important main roads crossed. 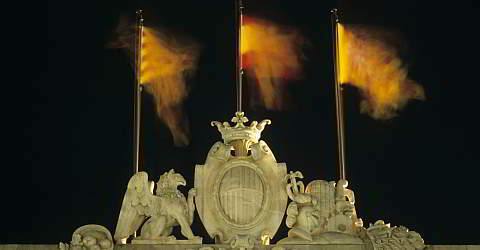 In 1931, the Republic was announced on the Plaça de Sant Jaume. And in 1977 the former president Taradellas announced his return from exile as a sign for the returned Catalan autonomy rights. Admiration can take place in the Palau de la Generalitat, the Palace of Catalan autonomy government, with bows hemmed round the courtyard of the 1532 built building, through the orange trees with a very idyllic effect. The interior of the building is built in Gothic style, although the neo-classical facade hides this. A visit to the building each Sunday and on the day of the 23rd April is possible, National Day of the Holy Sant Jordi. Opposite to the Genaralitat is the Ajuntament is the seat of the Town Hall with the mayor. This building is built in Gothic style. Some of these sides are still in their original facades, the main facade was also in classical style being rebuilt in 1847. At the Plaça Sant Jaume there are many festivals to official events. Here, Sardana is danced on by the human towers erected here by the Catellers. If, however, not just the big celebrations at the Plaza Sant Jaume are celebrated or if you do not want to visit one of the government palaces, the place is rather a stopover on the way to the cathedral.